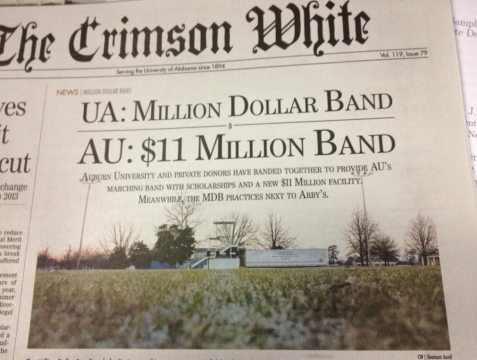 The front page of today’s Crimson White? 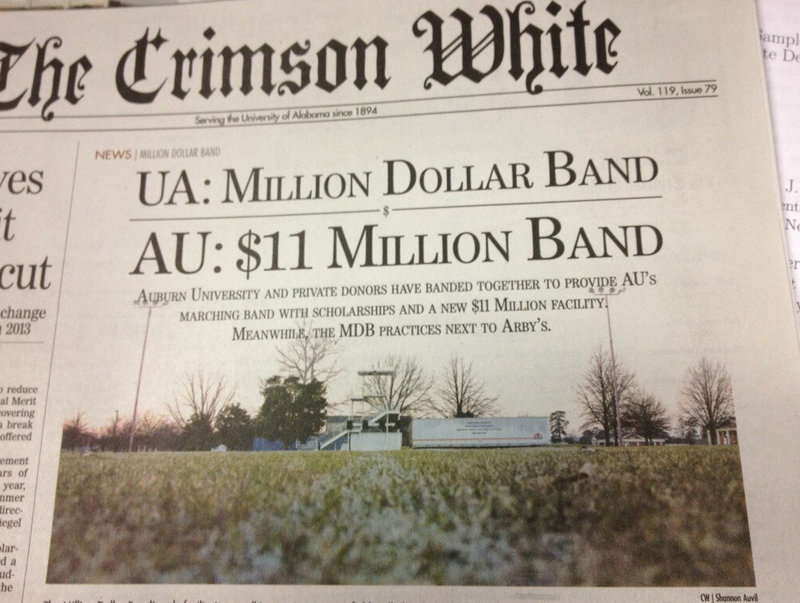 A story about how members of Alabama’s Million Dollar Band have to bring canteens to practice to avoid dehydration and then use the bathroom at Arby’s, while members of the Auburn University Marching Band will soon be relieving themselves like kings in their own trillion dollar bandtopia. That might be the best thing ever written in The Crimson White, or at least the best thing spelled correctly. At the very least it’s a refreshing change from how Auburn is typically covered. Related: Former Plainsman editor responds to Crimson White’s jab at ‘AWWWBURN’. And who is AUbsessed with who? Despite their high dollar name, that other band has always been a cheap imitation. Many of their band graduates probably end up working at places such as Arby’s and possibly aren’t able to endow band scholarships. YES!!! Take that, stick it in your tail pipe & smoke it! Our campus is already way prettier. Seems the only thing Bama has on us now is a Stadium! 😉 Go cry about, maybe yaw will get one but word is Most Likely NOT!!!! The CW article isn’t praising or criticizing either band. It is simply stating facts in an effort to raise awareness for the lack of an MDB facility. It is only logical to compare the closest collegiate band program (AUMB) to do so. Whoever wrote this took the article way out of context. Both the Million Dollar Band and the AUMB are some of the top programs in the SEC with highly motivated and dedicated students. The programs respect each other more than the fans do and these are opinions written by people not affiliated with either program. Please respect the organization’s and the students involved because they some job is to be ambassadors for their university and provide all spirit and enjoyment for the fans. P, obviously you don’t visit TWER very often. It’s funny because Auburn’s band director is an Alabama graduate. That is completely right. Trust me, now that these articles are out, the money for a Bama facility is gonna come racking in. Kind of like giving pigs a gold plated pen. I think we need to get someone to bud an Arby’s franchise next to the Auburn practice field. Awww….and here come the little Aub-sessed bammers to whine and complain over the article and TWER’s coverage of it. It’s like clockwork. Shame that they can’t enjoy bama boards, but would rather come here and troll ours…poorly, I might add. Thank you Chris!! Good to read something other than jealous hate!! As a proud supporter of The Tide!! It’s good to hear positives on “their” paper!!! This is some horrific vitriol, and I am not a fan of either team, but both sides should be ashamed! I’ve seen some horrendous grammatical errors on both sides, so the value of the degree from either school means nothing. Auburn clearly has a loyal fan base. Alabama clearly has winning seasons to their credit. Would you *both* say these same comments to your neighbor, co-worker, or friend who supported the other team? Insanity. Homewood88, These are our neighbors, co-workers and friends… so, yeah. Wow. Talk about being uneducated. AuburnElvis: You idea is MUCH better, we do need the Krystals! wow, just cannot type today.